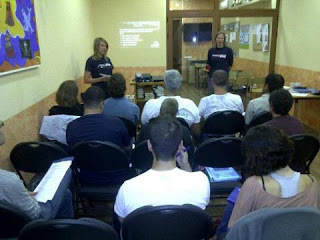 On Saturday, September 29th, the Barcelona Athletes in Action team offered some training to 4 churches in the city. A total of 17 people attended with the desire to serve with their churches through the medium of sports in their surrounding neighborhoods. This past summer Athletes in Action received a group from Holland who came to help develop a project where sports was used to connect adn serve the neighbors and people on the street. This project, called Heartbeat, is the model that several churches would like to develop in their own communities, using soccer, basketball adn other sports that can be played in the street and the nearby parks to build bridges and, in the long run, to change lives. Ellen Quarles and Jessie led this first training meeting in which they cast the greater, long-term vision, discussed the planning and the steps necessary as of now to make this dream a reality. During this training Ellen and Jessie, together with their team, offer helpful tools and mentoring to the leaders of this sports ministry in each church. On November 11, there will be a second training meeting to begin the training series with additional churches that would like to use sports in their neighborhoods to build relationships and to offer a service to the community. If you live in Barcelona and your church might be interested in using sports to build bridges for the gospel, don´t miss this training opportunity on November 11. Write us here at the blog and we´ll put you in contact with Ellen or Jessie to get you more information.